URSU TV is designed to provide information about upcoming events and ongoing services to students while also providing a feed of relevant information, including news and weather. It is also designed as an advertising medium for the university at large and for commercial businesses. URSU TV is an excellent cost efficient & flexible way to keep students up to date with your business’s ongoing promotions, service, or product. On any given day, a maximum 18 advertising slots are available for each URSU TV location. Each ad is displayed for ten seconds at a time, a minimum of 20 times per hour, on each screen. A single ad, on 9 screens located on the main floor of the Riddell Centre will be shown on average of 3,360 times per week during the busiest hours. Of course, when the network is running fewer ads, each ad will be seen more frequently. We have 22 fullscreen TVs located in high-traffic areas that allow for increased visibility impacts on more than 15,000 people on campus. Over 90% of the student population at the university is in the 18-34-year-old range, representing a key advertising demographic. There are more than 15,000 full-time and part-time students, faculty members, and staff working, living & studying at the U of R.
Using Statistics Canada’s formula to calculate the full-time equivalent, it is estimated that there are approximately 11,998 students on campus. Based on actual transactional data, we know that there are at least 3,300 transactions happening daily in the Riddell Centre food court alone. Given this, traffic count of the main Riddell Centre hallway is estimated to be 5000 views per day, or 100,000 views per month. Of these 15,000 individuals, approximately 80% are between the ages of 15-29. Advertising that uses a digital medium such as URSU TV is known as Digital Out-of-Home (OOH) advertising – a rapidly growing, well-received dynamic medium of communicating an idea, especially to a younger audience. 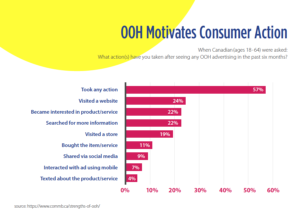 The medium engages consumers and motivates action. As such, it is an ideal way to quickly reach a large proportion of the University population. URSU TV’s rotation is updated throughout the week. All submissions must be received at least four business days before the campaign is set to begin. For longer campaigns, in order to keep your message fresh, we suggest updating your artwork periodically. Simply send us new artwork bi-weekly and we will be happy to change the content at no charge. 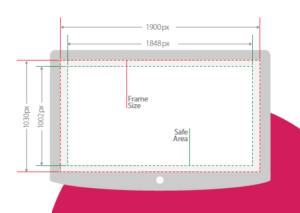 The advertiser is responsible for supplying final, screen-ready artwork based on the specifications outlined in this media kit. With all the necessary information and images provided by the client, this package offers a quick solution to get your ad ready for URSU TV. This package offers a creative design solution to make your ad highly visible & eye catching on URSU TV. 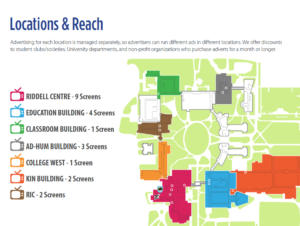 URSU has more than 30 Poster Boards around campus that are useful for advertising anything that might interest students. All posters hung on these boards require stamped approval from the URSU Member Services desk and must follow the current edition of the URSU Poster Policy. Please note that space can be very limited and, as such, students and on-campus groups receive higher priority. Posters will be hung for 30 days unless arranged otherwise with Members Services. Posters hung outside of approved poster boards will be taken down. URSU offers table rentals in the Riddell Centre, the Laboratory Building, and the Classroom building. These tables are an opportunity to advertise your cause, event, or sell goods. All tables rentals must follow the current edition of the Corridor_Use_and_Tabling_Policy_2016. Tables cannot be used without booking them in advance through our Member Services desk. If you want to sell food at your table, it must be approved by URSU and must also follow the relevant RQHR food regulations.